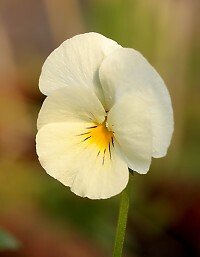 Pansies are very popular flowers in British gardens. They make an excellent display in flowerbeds, pots and hanging baskets. There are many, many varieties of all sizes and colours. Some are even hardy during the winter months. The flowers are made up of 5 rounded petals. The top petal is larger than and overlapping the others. Sadly, we cannot grow many pansies in our garden. They are a great favourite with the deer and the rabbits. See our article "Plants that Deer don't Eat".